GPCRs are fundamental membrane proteins and they are called as G-Protein Couple Receptors. They are rooted in the cell surface that conveys signals to cell, also known as seven membrane domain receptors. 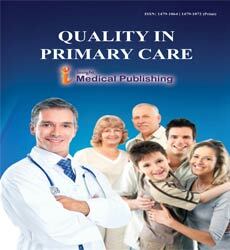 If these receptors do not role correctly, then this may lead to numerous diseases. Orphan Receptors lack endogenous ligands and their particular purpose is not known. Presently there are few ideal structures in databank for following structural biology studies but no orphan GPCR coordinates exist in protein data bank. The aim for gaining appropriate structures for these proteins is to deorphanize them and to study biological applications. There are numerous GPCRs whose 3D structures are obtainable, using those structures as templates, computer based homology modeling method can be used to presume 3D structures of numerous proteins by means of their amino acid sequence. In this study, we have modeled Q99MX9_MOUSE and G2A_ MOUSE, class an orphan GPCRs whose 3D structures have been assumed using Swiss pdb Viewer; the PDB templates used for these orphan GPCRs are 2RH1 and 3UON correspondingly. Based on the outcome of homology modeling of these proteins, their structure has been acquired and their purpose can be presumed on the basis of structural and sequence similarity to known GPCRs. As the structure has been assumed for these GPCRs probable ligands and similarities can be anticipated. In situation of the human genome, GPCRs are the main gene superfamily. Maximum of the drug based research is going on in this field because not working of these receptors lead to numerous diseases. Considerate their structures, functions and ligand binding sites can aid in drug design which can aid in dealing with the diseases. Deorphanization of orphan GPCRs can widen research and help in discovering new drug targets and also aid in understanding the functioning of the orphan GPCRs on cellular level, as they are involved in numerous signaling pathways. 1. Two orphan GPCRs – Q99MX9_mouse and G2A_mouse were selected using GLIDA. 2. The fasta files of these two orphan G-proteins were retrieved. 3. Protein Blast was done and subsequent hits were obtained. 4. The pdb ID’s of different templates of interest that are 2RH1 and 3UON were fetched and downloaded using PDB. 5. The fasta sequences of the orphan G-proteins and their respective templates were uploaded in swiss-prot. 6. Homology Modelling was done and the resulting modeled proteins were saved as .pdb files. 7. The energies were checked using swiss pdb viewer. For the structure to be in stable state its energy should be minimum. 8. 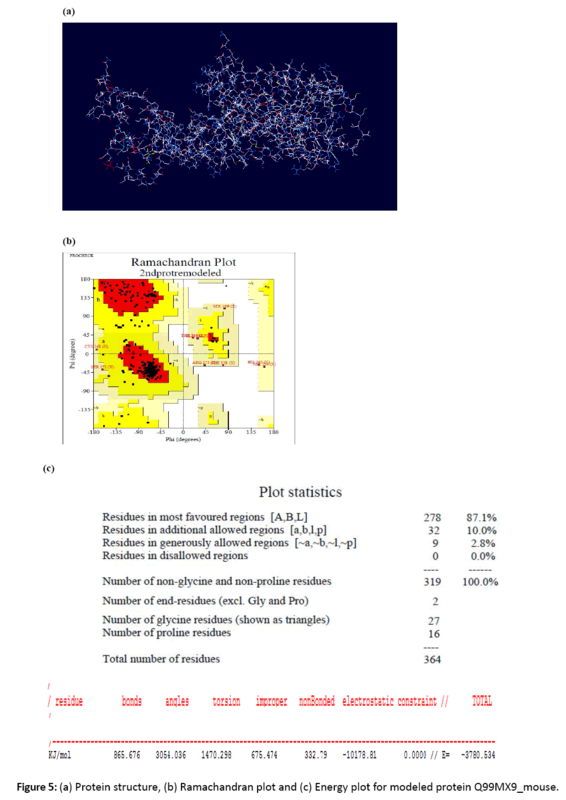 The ramachandran plots were studied for the modeled proteins and the residues residing in favorable and allowed regions were studied using Structural Analysis and Verification Server. 10. Subsequently energies were computed and the modeled structures were checked for the same. 11. 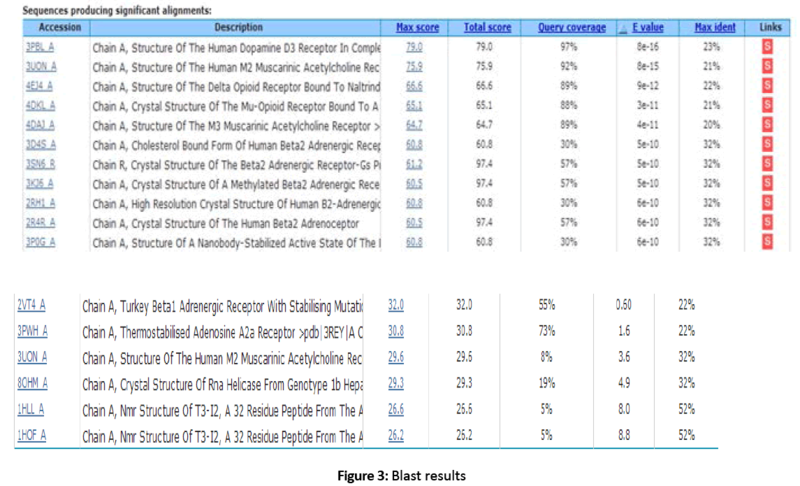 The active sites or ligand binding sites were predicted using CASTp server. 12. The fasta sequences of the modeled orphan G proteins were saved and used as an input format in BLAST. 13. 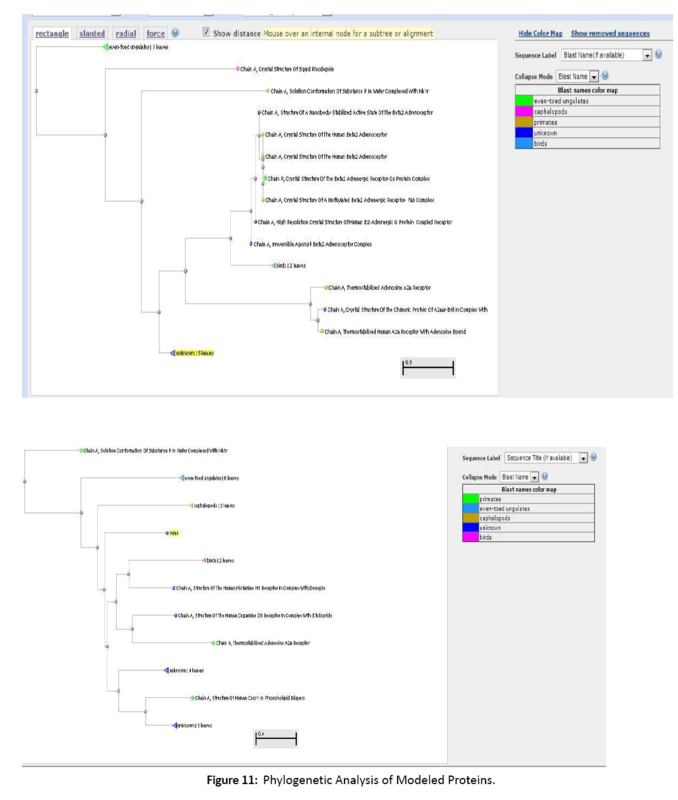 Phylogenetic analysis was done. 14. On the basis of Phylogenetic analysis, the possible functions were predicted. Figure 1: Result for Query Q99MX9_MOUSE. 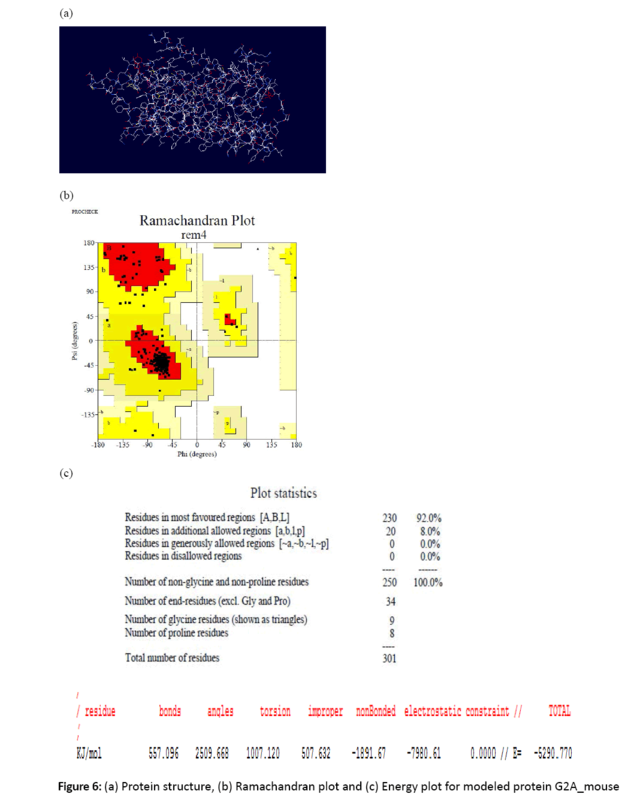 Figure 5: (a) Protein structure, (b) Ramachandran plot and (c) Energy plot for modeled protein Q99MX9_mouse. 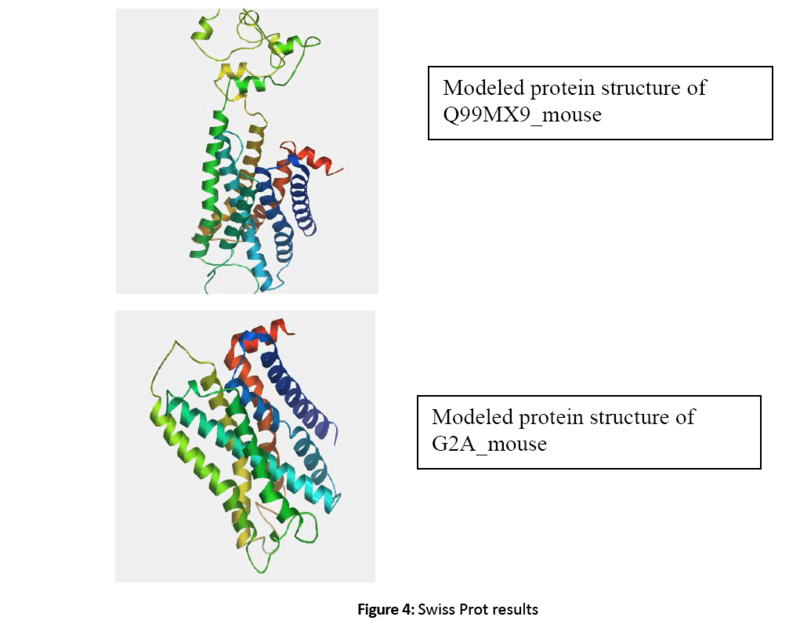 Figure 7: Fasta file of modeled protein Q99MX9_mouse. Figure 8: Fasta file of modeled protein G2A_mouse. Figure 9: CASTp results of Q99MX9_mouse. 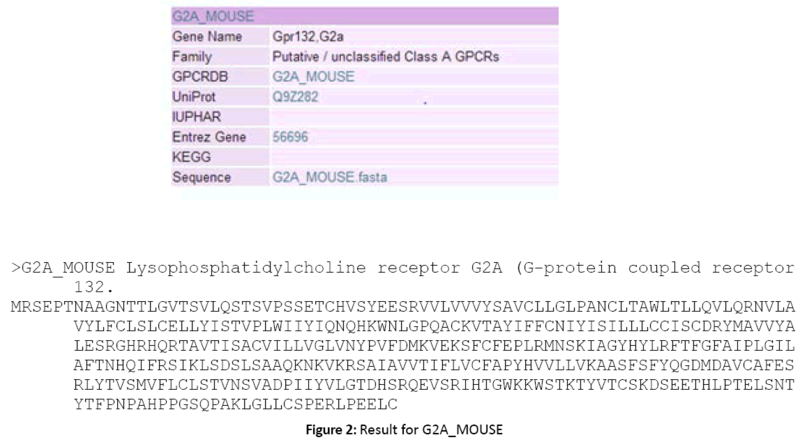 Figure 10: CASTp results of G2A_mouse. Figure 11: Phylogenetic Analysis of Modeled Proteins. 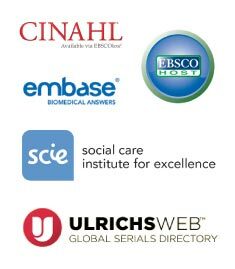 Watson S, Arkinstall S. The G protein Linked Receptors Facts Book. New York: Academic Press 1994; 427 p.
Flower DR. Modelling G-protein-coupled receptors for drug design. biochimBiophysActa 1999; 1422: 207-234. Takeda S, KadowakiS,Haga T, TakaesuH,Mitaku S (2002) Identification of G protein coupled receptor genes from the human genome sequence. FEBS Lett 520: 97-101. Collins FS. Finishing the euchromatic sequence of the human genome. Nature 2004; 431: 931-945. George SR, O’Dowd BF, Lee SP. G-protein –coupled receptor oligomerisation and its potential for drug discovery nature Rev. DrudDiscov 2002; 1808-820. Skolnick J, Fetrow JS, Kolinski A. Structural genomics and its importance for gene function analysis. Nat Biotechnol 2000; 18:283-287. Kuhlbrandt W, Gouaux. Memberane proteins. CurropinStructBiol 1999; 9: 445-447. Palczewski K, Kumasaka T, Hori T, Behnke CA, Motoshima H. Crystal structure of rhodopsin: a G protein-coupled receptor. Science 2000; 289: 739-745. AL Hopkins, CR Groom. Nat. Rev. Drug Discovery 2002; 1 727-730. Wess G, Drug Discovery Today 2002; 4: 533-535. Singh SK, Singh A, Prakash V, C SK. Structure modeling and dynamics driven mutation and phosphorylation analysis of Beta-amyloid peptides. Bioinformation 2014; 10:569-74.